One of the unfortunate fallouts of being treated with antidepressants is the possibility of experiencing unpleasant and often intolerable side effects. In fact, side effects such as weight gain, insomnia, sexual dysfunction, irritability, headache and diarrhea are quite common with this class of drugs. Added to the list of negatives is the fact that they only seem to help about 30% of the patients who take them. So imagine a treatment for depression that had few, if any, side effects and also was effective in relieving disease symptoms. Such a treatment exists and is quickly becoming the-state-of-the-art method for care. Transcranial magnetic stimulation (TMS) offers relief to many who have given up hope of ever being free from depression. And, fortunately, TMS therapy side effects, if any, are mild in nature and often dissipate during the course of treatment. TMS is an alternative treatment measure for major depressive disorder (MDD) that was cleared by the FDA in 2008. TMS utilizes magnetic pulses that are delivered through a coil placed on the patient’s head, targeting the prefrontal cortex of the brain. The technology used is similar to that of an MRI machine. The magnetic pulses induce electrical currents that are able to “wake up” dormant or underactive brain cells located in the mood center of the brain, the limbic region. Over the 4-6 week course of treatments, TMS can rebalance the brain’s chemistry, which often translates to remission. A newer, more powerful version called deep TMS (dTMS) came to market in 2013. The key difference between standard TMS and dTMS is that in dTMS the electromagnetic currents reach a depth of 6 cm, versus only 2.5 cm. In addition, the coil has a different design, called an H-coil, which is embedded into a comfortable helmet and allows for a more thorough and comprehensive targeting. Because of these design updates, dTMS sessions last only 20 minutes, versus 40 minutes with standard TMS. In multiple studies, and with about 8 years of clinical use, TMS therapy side effects have been shown to be both mild and transient, with no systemic negative effects. When adverse effects are cited they typically disappear without any intervention during the weeks of treatment. The TMS therapy side effects reported have included mild to moderate headache, scalp irritation or discomfort, and lightheadedness. Because TMS and dTMS require no sedation, the health risks that are associated with anesthesia are not present. Patients undergo the TMS treatments while seated comfortably in a chair, fully alert. Many pass the minutes listening to music or watching TV. Immediately following the therapy, patients are free to resume normal daily activities with no down time required. The therapy starts to produce positive changes after about two weeks, or 10 treatment sessions. In most cases, the first sign that TMS is working is improved sleep quality reported by patients. As the treatment sessions proceed the patients begin to notice they are able to focus and concentrate better. By the completion of the cycle of sessions most patients report significant reduction or elimination of depressive symptoms. In double-blind studies, over 70% of patients demonstrate response to treatment and over 50% are in remission by the time treatment is completed. The treatment is currently covered by most major insurance companies in the U.S. 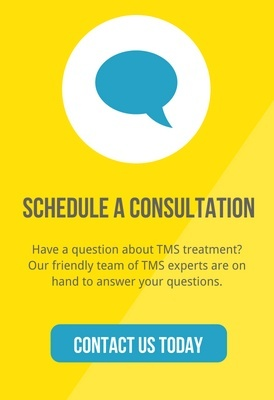 Achieve TMS is the leader in providing expert dTMS depression treatment. With multiple convenient locations on the west coast, Achieve TMS has carved out a reputation for top-notch, professional care in treating depression. The doctors and clinical professionals specialize in tailoring the dTMS treatments to be perfectly calibrated to the needs each patient. For more information about this treatment, please call us today at (877) 447-6503 for a free consultation and insurance authorization.